Silver Past Master's Jewel suspended from a sky blue ribbon by two silver fret work bars. 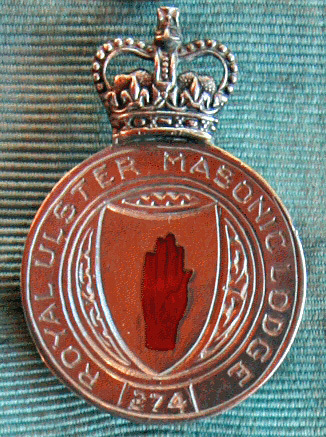 Centred on the ribbon is a crest, which comprises of the red hand of Ulster, with a Crown on top thereof, and the name and number of the Lodge, "Royal Ulster Masonic Lodge 274", on the circumference. The Compass and Square is a standard silver Past Master's Jewel with a fixed "G". 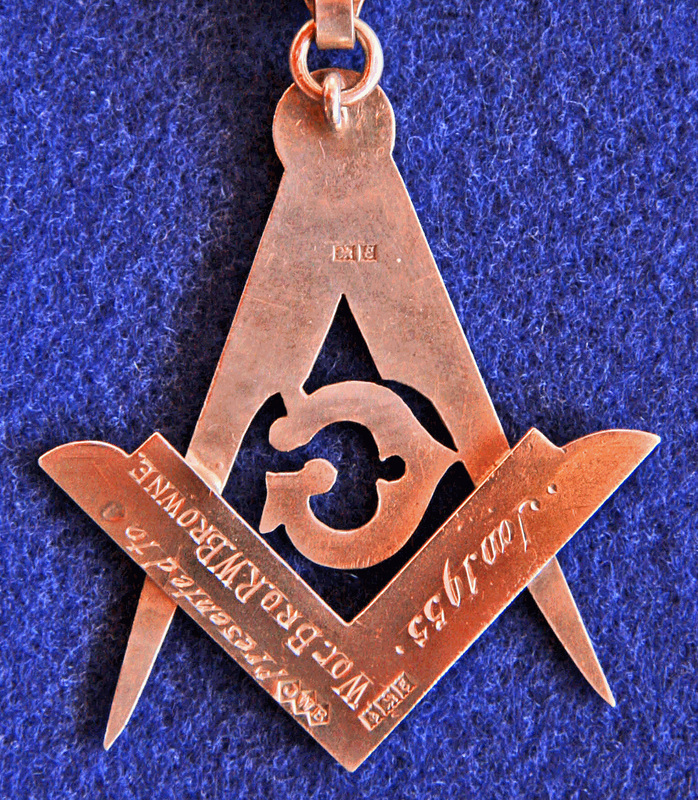 The bottom bar above the jewel has "1954", the year the holder was Worshipful Master. The Maker's Mark on the reverse of Jewel is "JWB". Short History of Warrant No. 274. Warrant No. 274 issued to brethren in GALWAY, Co. Galway on the 15th December, 1756 and was cancelled on the 5th July, 1821. Warrant No. 274 was removed from Galway to Tuam on the 7th March, 1822 and a Duplicate Warrant issued, however Warrant No. 274 was cancelled as soon as the 7th July, 1825. Warrant No. 274 reissued to `Albert Edward Lodge' in AGHALEE, Lurgan, Co. Armagh on the 22nd September, 1873 and was returned on the 3rd October, 1881 to be Held in Trust but was never returned to the said Brethren. History of Royal Ulster Lodge No. 274. "29 May, 1899 - Read Memorial from Bros. Barr, Weir, Hall and sixteen others praying for a Warrant to establish a Lodge in Belfast to be called the “Royal Ulster” Recommended by Lodges 272, 609, 42 and by the P.D.G. Master of Antrim. Regular fee enclosed. The Board recommended the issue of a Warrant to the applicants to be numbered 274." The Recommendation of The Board was followed,as is shown in the Grand Lodge Minutes of 1st June 1899 as "Confirmed". Warrant No. 274 reissued to `Royal Ulster Lodge' in ARTHUR SQUARE, BELFAST on the 1st June 1899 and on the 19th June, 1899 the Lodge was duly dedicated by Bro. R.J. Hilton, Right Worthy Provincial Deputy Grand Master, assisted by the Provincial Grand Officers of Antrim. Bro. John Barr, P.M., was Installed as W.M., and Bros. Daniel Weir, John Hall, P.M., and John J. Montgomery, P.M., as Senior Warden, Junior Warden, and Secretary respectively. R.W. Provincial Deputy Grand Master of Antrim. A further 16 brethren, eight from Lodge No. 97, registered on the 2nd June, 1899. A total of 33 brethren registered up to 1st October, 1900. In most cases the dates when the degrees were conferred and the issue of certificates is shown. Fifteen members served in the 1914 -18 War and Bros. Lieut. J.T. Adair, Lieut. R. McLaurin, Lieut. A.R. Mercer, Sub. Lieut. N.G. Paton, RNVR and Capt. E. Sinton, MC made the supreme sacrifice. Series five Vol. 18 shown as Vol. 2 of the extant Grand Lodge Register commences with the registration of William McK. Orr, Clerk, registered 6th October, 1924. Sir Samuel Kelly, CBE, D.L. Three Brethren of Royal Ulster Lodge No. 274 were Knighted by His Majesty the King namely Sir William Turner, D.L., Sir Samuel Kelly, CBE, D.L. and Sir Thomas Wilson, J.P.
A total of 73 brethren registered up to 4th February, 1952. In most cases the dates when the issue of certificates is shown, together with the occupation of the brother. Series six Vol. 21 of the extant Grand Lodge Register commences with the registration of F. H. O., Under-Graduate, registered 2nd March, 1953. 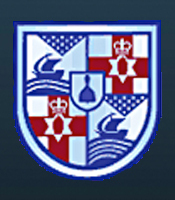 A total of 53 brethren registered up to 20th September, 1982. In most cases the dates when the issue of certificates is shown, together with the occupation of the brother. Warrant No. 274 was removed to ROSEMARY STREET, BELFAST, in 1963. The Grand Lodge Minutes of the 27th December, 1999 in regard to the return of Warrant No. 274 shows "Noted". Warrant No. 274 of Royal Ulster Lodge No. 274 was returned to Grand Lodge on the 31st December, 1999. "10 Feb 2000 - The Board noted with regret for reporting to Grand Lodge the decision of the Brethren of Lodge No. 274 Belfast to return the Warrant to Grand Lodge." Warrant No. 274 Laboured on and off from 1756 to 1999 for some 246 years.